We decided to venture down to the Burlington Lift Bridge for a second time in two (2) days, as we realized we missed a few key species that had been reported on eBird within the area. One of the biggies were the pair of Peregrine Falcons that nest within the Lift Bridge Canal. 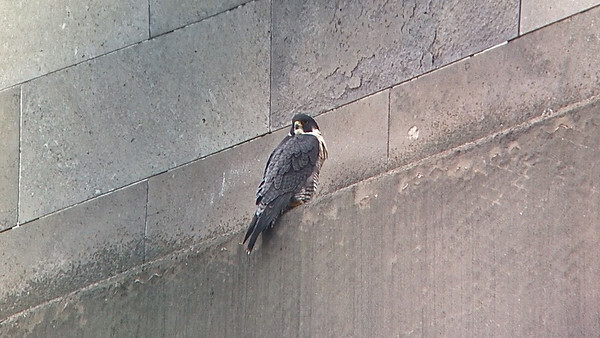 When we arrived, the FIRST bird we saw was a Peregrine in flight. The bird then perched on the Skyway bridge for a lengthy period of time, allowing Anthony to “Digiscope” the bird and obtain some decent photos on a VERY windy day! After reviewing the photos when we returned home, we could see it was a GREEN/black leg band, which would indicate the we viewed the female, “Cirrus”. Mackenzie, the male sports a black (no green) leg band. Cirrus hatched in 2006 at the AT&T building in Dayton, Ohio. She has a Black K over Green 83 leg band. She is the daughter of “Snowball and Mercury”. Mackenzie hatched in 2009 at the Sun Life Centre in Etobicoke, Ontario. He has a black leg band, “29/Y” and was banded on May 26, 2009. Mackenzie replaced “Sir Adam Beck” as Cirrus mate back in 2011.